Eating hot dogs is not something that really fits with my reputation. It is true that I do not generally eat hot dogs. 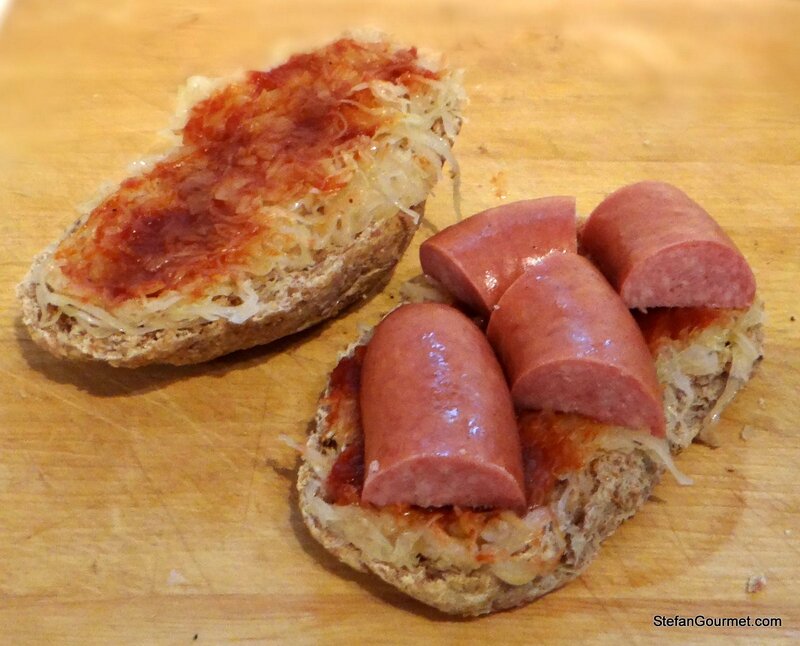 In winter I do however like to make my own gourmet version and that goes like this: I bake my own wholewheat buns, I procure artisan prize-winning smoked pork sausage (rookworst) from the butcher I frequent, and I serve it with sauerkraut and home-made ketchup. 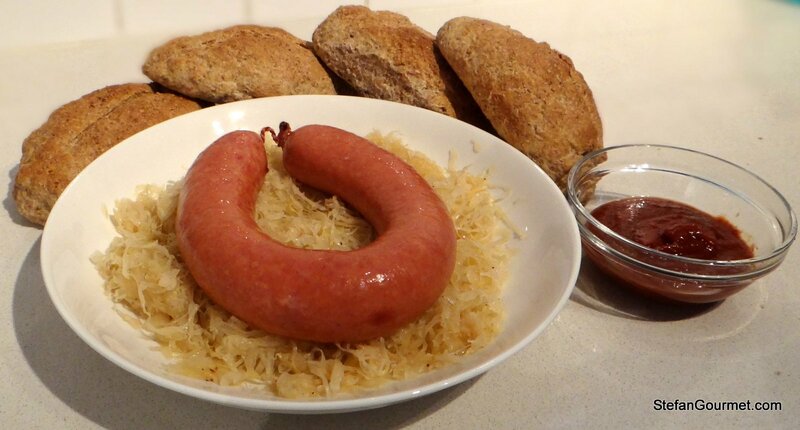 Home-made mustard and home-made sauerkraut would also be nice, but those are bridges I haven’t crossed just yet. And who knows, perhaps I’ll even smoke my own pork sausage one day? In any case, my “hot dog” tastes a lot better than one from a street vendor. Gently heat up the sausage. This goes well on top of the sauerkraut. Slice open the buns. 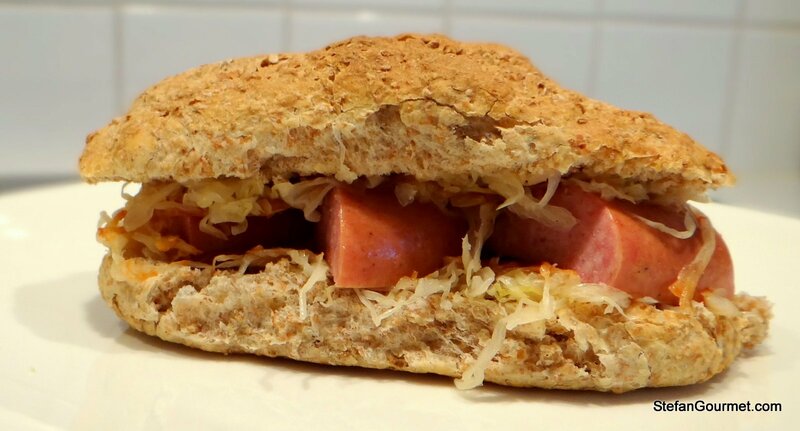 Cover both sides with a thin layer of sauerkraut. Add ketchup or other condiments to taste. Add sausage. Interesting recipe! I shall try it. I just love cut-up sausages on bread! I shall try it this weekend. So enticing! Where is your ketchup recipe? I made a recipe posted by ChgoJohn but didn’t take pictures to post about it. I will next time! So NOT the Stefan we know. Interesting all the same. ps: The smoker arrived. Identical to yours. Now what to smoke? A great first to smoke is salmon fillet (with skin is easiest). Salt, black pepper, lemon juice, olive oil. Smoke for 15-20 mins depending on thickness. You only need 2 Tbsp of beech dust. Now, this is the way to have a hot dog, à la Stefan!